I've hit a bit of a "maker slump" over the last few weeks. I've attempted several projects that, for one reason or another, just haven't worked out. It's been pretty discouraging. So, I decided to break the slump and back up and do something super simple. I have a Couchbed in my office. 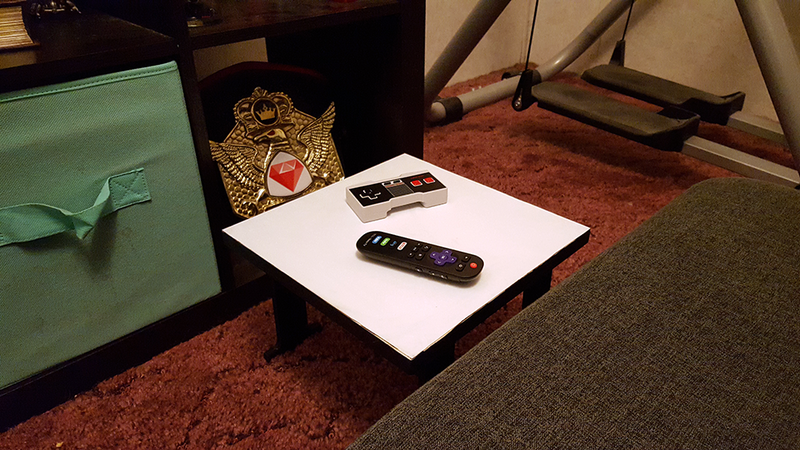 It sits about a foot away from a bookshelf that, as of a couple of days ago, holds a 32in smart TV and my NES classic, among other things. It sits very low to the ground and a foot is not a lot of leg room, but I don't have super long legs and can always stretch out on the couch itself, so it works out. It's a comfortable place to sit and relax, but I wanted a small, low table that I could pull out and set between the bookshelf and the couch for drinks and what not. 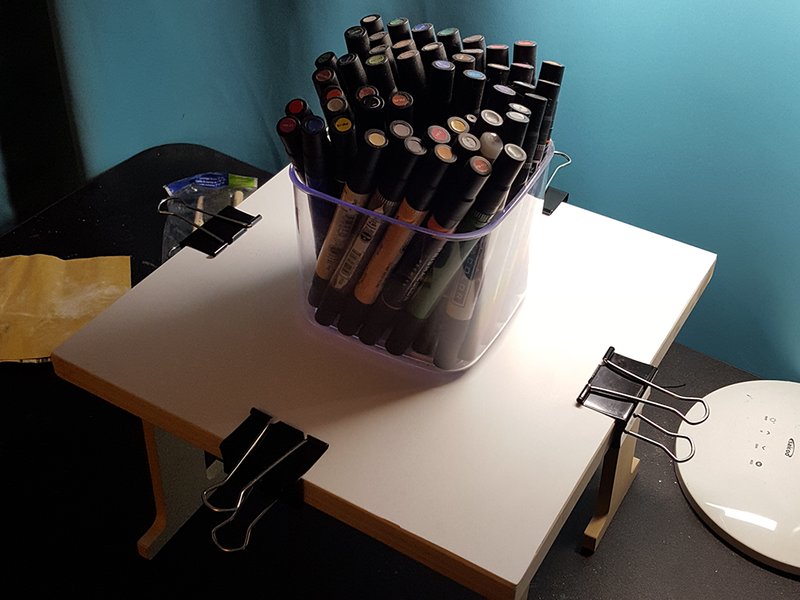 I looked at a couple of folding breakfast trays but in the end, I decided making a little table would be more fun than buying something. So I went shopping. This is where it gets weird. 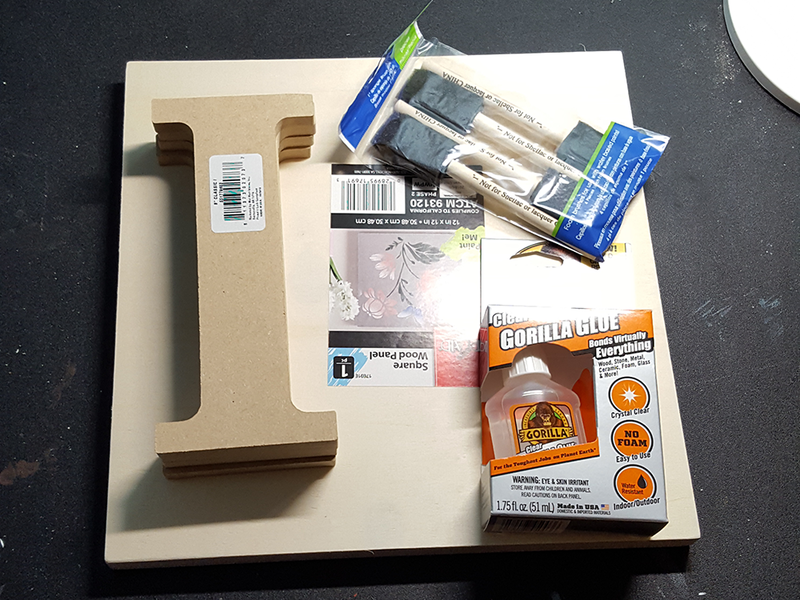 I picked up a 12in square wooden "canvas" meant for painting on, some glue, some foam brushes and.... 4 wooden letters "I." 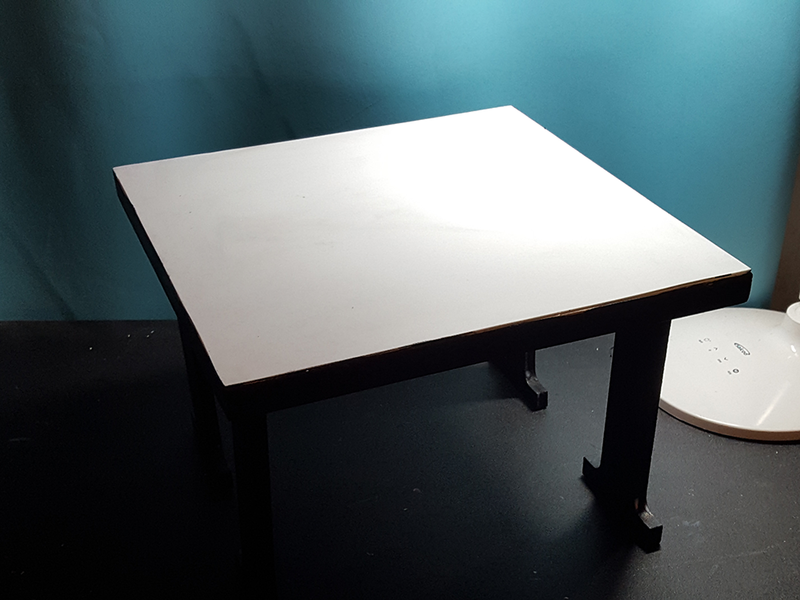 Mind you, this table doesn't have to be perfectly square or support more weight than a soda can, so I don't think I'll need a any type of cross-bracing or additional support. 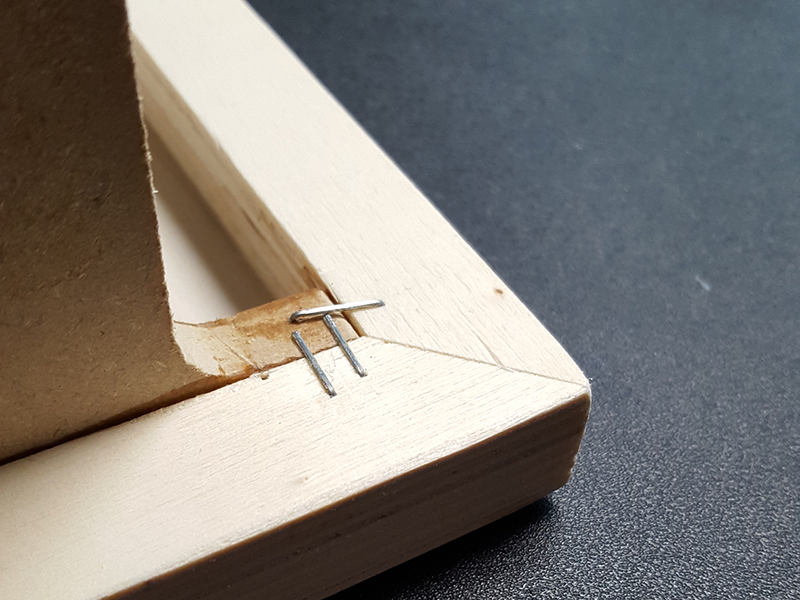 I pulled out my staple gun and added a few staples to hold things in place while the glue dried, since I didn't have any clamps sized right to hold things together. It wasn't perfect, but it worked. But I want to put drinks on this thing, so something more durable than the thin, unfinished wood would be nice. 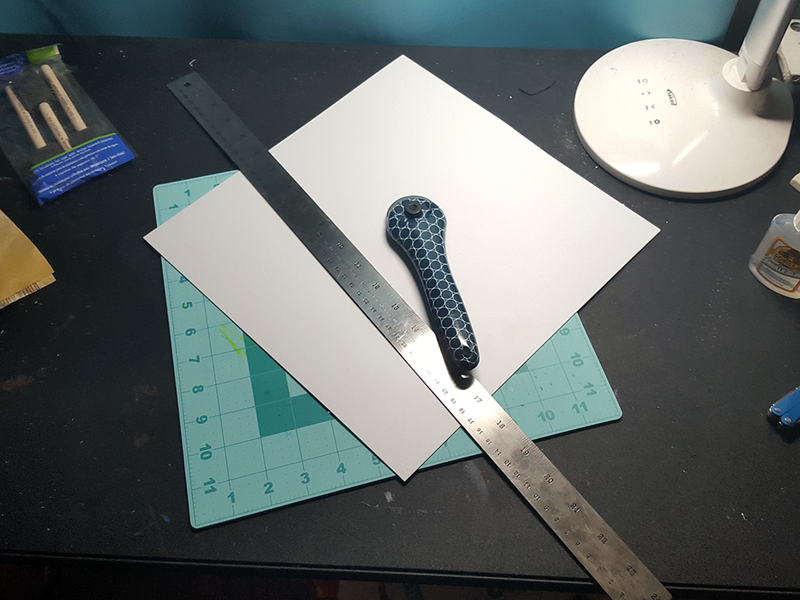 Fortunately, I had a sheet of 0.04 styrene left over from a previous project that failed horribly and I decided it would make a good table top. I trimmed it down to size with the roller cutter I bought recently. It was a lot easier than trying to use a utility knife. Then I glued it on, clamped it in place, and set some heavy stuff on it for a few hours. 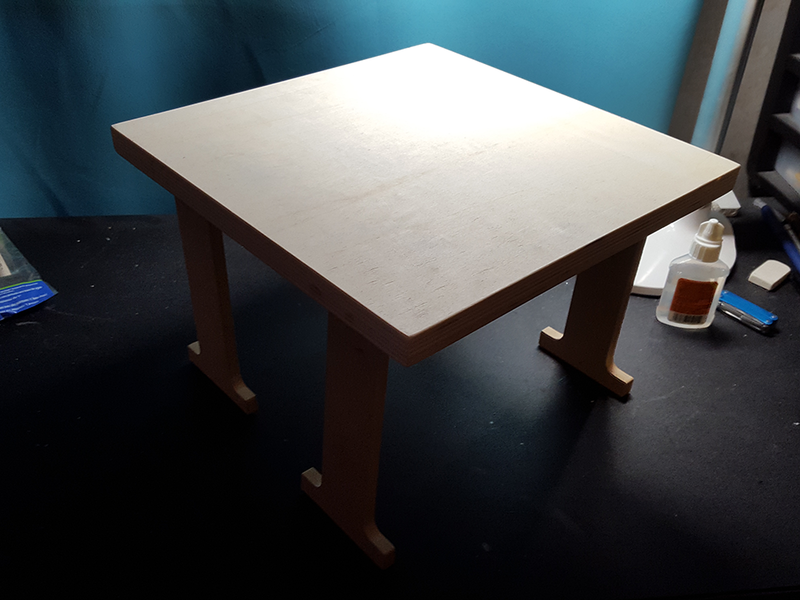 I was going to stain the rest of the table, but it started pouring rain, so I decided to just paint it, instead and, with that, my tiny table was done. Here's an action shot of the table tabling. It's the perfect fit and perfect height! 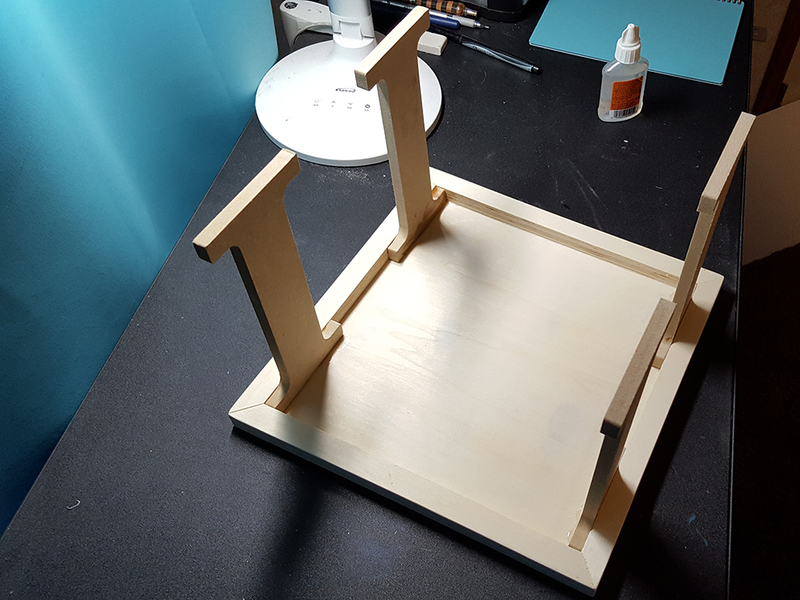 Nothing is precise, some edges are rough, and the legs aren't square, but it's sturdy and does exactly what I need it to, and... it was something I made that didn't end up in the trash heap. The way things have been going lately, I'm calling it a win.